The proposed Federal Highway Administration(FHWA) amendments to the Manual on Uniform Traffic Control Devices(MUTCD) will change the way local agencies manage their pavement markings and place a focus on pavement marking quality and management methods. The research effort covered in this report demonstrates how a pavement marking maintenance method can be developed and used at the local agency level. 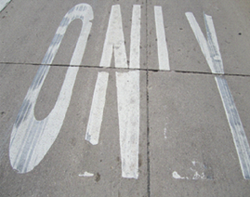 The report addresses the common problems faced by agencies in achieving good pavement marking quality and provides recommendations specific to the problems, in terms of assessing pavement marking needs, selecting pavement marking materials, contracting out pavement marking services, measuring and monitoring performance, and developing management tools to visualize pavement marking needs in a geographical information system(GIS) format. The research includes five case studies, for three counties and two cities, where retroreflectivity was measured over a spring and fall season and then mapped to evaluate pavement marking performance and needs. The research also includes more than 35 field demonstrations (installation and monitoring) of both longitudinal and transverse durable markings in a variety of local agency settings, all within an intense snow plow state.